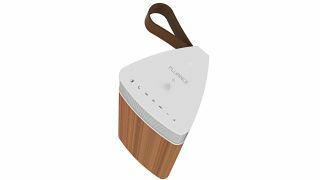 Fluance Fi20: a gorgeous Bluetooth speaker with 24-hour battery life | What Hi-Fi? Canadian hi-fi and home cinema brand Fluance, who were recently introduced to us through its very likeable RT81 budget turntable, has launched an omni-directional, portable wireless speaker. And an attractive one at that. The Fluance Fi20 looks as much a mantelpiece ornament as an audio product, with a wooden exterior that not only looks lovely but has been chosen for its resonance absorption quality necessary to create a warm sound. The Fi20 has been designed to disperse music in every direction through its 3in linen finer driver and upward-firing woofer, and its built-in battery promises 24 hours of playback from a single charge. Users can stream music to the Fi20 over aptX Bluetooth or plug their source device into the 3.5mm input. The Fluance Fi20 is available now in walnut or bamboo, as well as black, for $150.